Quality Stainless Steel 200 litre wine tank, Tank dimensions are 50cm wide by 120cm tall (200l), Complete with floating lid, gasket, pump and spigot,Floating lid adjusts to varying levels of volume to keep out air during secondary fermentation and bulk aging. Made in Italy. Italian made grape destemmers by Grifo to suit the smaller producer. Large hopper with an auger to ensure the consistent feed needed ensure clean destemming. Gears and supports are made of nylon and self lubricating. All rotating shafts work on ball bearings for quiet operation and durability, and the destemmer drum is stainless steel for easy cleaning. A simple and powerful sturdy fruit press for hobby juice/wine makers. Screw fruit press is designed for juicing of previously prepared fruit. 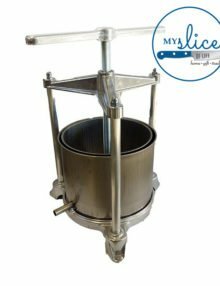 Can be used for apples, grapes or other soft/pulped fruit. Heavy-duty, coated, cast iron, double ratcheting head to press with greater pressure and ease. Easy pour bottom spout and enameled steel base.